Actuate, Alpine, Alteryx, Angoss, Apache Flink, Apache Hive, Apache Mahout, Apache MXNet, Apache Pig, Apache Spark, BMDP, C, C++ or C#, Caffe, Cognos, DataRobot, Domino Data Labs, Enterprise Miner, FICO, FORTRAN, H2O, Hadoop, Info Centricy or Xeno, Java, JMP, Julia, KNIME, Lavastorm, MATLAB, Megaputer or PolyAnalyst, Microsoft, Minitab, NCSS, Oracle Data Miner, Prognoz, Python, R, RapidMiner, Salford SPM, SAP, SAS, Scala, Spotfire, SPSS, SPSS Modeler, SQL, Stata, Statgraphics, Statistica, Systat, Tableau, Tensorflow, Teradata, Vowpal Wabbit, WEKA/Pentaho, and XGboost. Does it run natively on your computer? Does the software provide all the methods you need? If not, how extensible is it? Does its extensibility use its own unique language, or an external one (e.g. Python, R) that is commonly accessible from many packages? Does it fully support the style (programming, or menus and dialog boxes, or workflow diagrams) that you like? Are its visualization options (e.g. static vs. interactive) adequate for your problems? Does it provide output in the form you prefer (e.g. cut & paste into a word processor vs. LaTeX integration)? Does it handle large enough data sets? Do your colleagues use it so you can easily share data and programs? Let’s examine each of them in turn. One of the best ways to measure the popularity or market share of software for data science is to count the number of job advertisements for each. Job advertisements are rich in information and are backed by money so they are perhaps the best measure of how popular each software is now. Plots of job trends give us a good idea of what is likely to become more popular in the future. Indeed.com is the biggest job site in the U.S., making its collection the best around. As their co-founder and former CEO Paul Forster stated, Indeed.com includes “all the jobs from over 1,000 unique sources, comprising the major job boards – Monster, Careerbuilder, Hotjobs, Craigslist – as well as hundreds of newspapers, associations, and company websites." Indeed.com also has superb search capabilities and it includes a tool for tracking long-term trends. Searching for jobs using Indeed.com is easy, but searching for software in a way that ensures fair comparisons across packages is tricky. Some software is used only for data science (e.g. SPSS, Apache Spark) while others are used in data science jobs and more broadly in report-writing jobs (e.g. SAS, Tableau). General-purpose languages (e.g. C, Java) are heavily used in data science jobs, but the vast majority of jobs that use them have nothing to do with data science. To level the playing field I developed a protocol to focus the search for each software within only jobs for data scientists. The details of this protocol are described in a separate article, How to Search for Data Science Jobs. All of the graphs in this section use those procedures to make the required queries. I collected the job counts discussed in this section on February 24, 2017. One might think that a sample of on a single day might not be very stable, but the large number of job sources makes the counts in Indeed.com’s collection of jobs quite consistent. The last time I collected this data was February 20, 2014, and those that were collected using the same protocol (the general purpose languages) yielded quite similar results. They grew between 7% and 11%, and correlated r=.94, p=.002. Figure 1a shows that SQL is in the lead with nearly 18,000 jobs, followed by Python and Java in the 13,000’s. Hadoop comes next with just over 10,000 jobs, then R, the C variants, and SAS. (The C, C++, and C# are combined in a single search since job advertisements usually seek any of them). This is the first time this report has shown more jobs for R than SAS, but keep in mind these are jobs specific to data science. If you open up the search to include jobs for report writing, you’ll find twice as many SAS jobs. Next comes Apache Spark, which was too new to be included in the 2014 report. It has come a long way in an incredibly short time. For a detailed analysis of Spark’s status, see Spark is the Future of Analytics, by Thomas Dinsmore. Tableau follows, with around 5,000 jobs. The 2014 report excluded Tableau due to its jobs being dominated by report writing. Including report writing will quadruple the number of jobs for Tableau expertise to just over 2o,ooo. Figure 1a. The number of data science jobs for the more popular software (those with 250 jobs or more, 2/2017). Apache Hive is next, with around 3,900 jobs, then a very diverse set of software comes next, with Scala, SAP, MATLAB, and SPSS, each having just over 2,500 data science jobs. After those, we see a slow decline from Teradata on down. Much of the software had fewer than 250 job listings. When displayed on the same graph as the industry leaders, their job counts appear to be zero; therefore I have plotted them separately in Figure 1b. Alteryx comes out the leader of this group with 240 jobs. Microsoft was a difficult search since it appears in data science ads that mention other Microsoft products such as Windows or SQL Server. To eliminate such over-counting, I treated Microsoft different from the rest by including product names such as Azure Machine Learning and Microsoft Cognitive Toolkit. So there’s a good chance I went from over-emphasizing Microsoft to under-emphasizing it with only 157 jobs. Figure 1b. The number of analytics jobs for the less popular software (under 250 jobs, 2/2017). Next comes the fascinating new high-performance language Julia. I added FORTRAN just for fun and was surprised to see it still hanging in there after all these years. Apache Flink is also in this grouping, which all have around 125 jobs. H2O follows, with just over 100 jobs. I find it fascinating that SAS Enterprise Miner, RapidMiner, and KNIME appear with a similar number of jobs (around 90). Those three share a similar workflow user interface that make them particularly easy to use. The companies advertise the software as not needing much training, so it may be possible that companies feel little need to hire expertise if their existing staff picks it up more easily. SPSS Modeler also uses that type of interface, but its job count is about half that of the others, at 50 jobs. Bringing up the rear is Statistica, which was sold to Dell, then sold to Quest. Its 36 jobs trails far behind its similar competitor, SPSS, which has a staggering 74-fold job advantage. The open source MXNet deep learning framework, shows up next with 34 jobs. Tensorflow is a similar project with a 12-fold job advantage, but these two are both young enough that I expect both will be growing rapidly in the future. In the final batch that has few, if any, jobs, we see a few newcomers such as DataRobot and Domino Data Labs. Others have been around for years, leaving us to wonder how they manage to stay afloat given all the competition. It’s important to note that the values shown in Figures 1a and 1b are single points in time. The number of jobs for the more popular software do not change much from day to day. Therefore the relative rankings of the software shown in Figure 1a is unlikely to change much over the coming year. The less popular packages shown in Figure 1b have such low job counts that their ranking is more likely to shift from month to month, though their position relative to the major packages should remain more stable. Each software has an overall trend that shows how the demand for jobs changes across the years. You can plot these trends using Indeed.com’s Job Trends tool. However, as before, focusing just on analytics jobs requires carefully constructed queries, and when comparing two trends at a time, they both have to fit in the same query limit. Those details are described here. I’m particularly interested in trends involving R so let’s see how it compares to SAS. In Figure 1c we see that the number of data science jobs for SAS has remained relatively flat from 2012 until February 28, 2017 when I made this plot. During that same period, jobs for R grew steadily and finally surpassed jobs for SAS in early 2016. As noted in a blog post (and elsewhere in this report), use of R in scholarly publications surpassed those for SAS in 2015. Figure 1c. 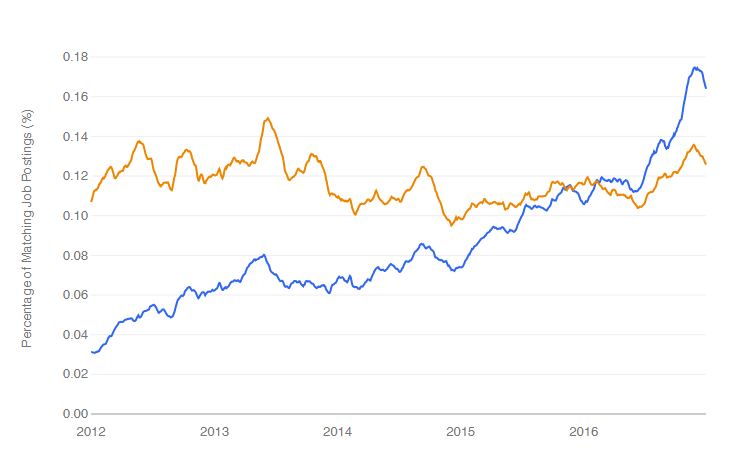 Data science job trends for R (blue) and SAS (orange). A long-standing debate has been taking place on the Internet regarding the relative place of Python and R. Ironically, this debate about data science software has involved very little actual data. However, it is possible now to at least study the job trends. Figure 1a showed us that Python is well out in front of R, at least on that single day the searches were run. What has the data looked like over time? The answer is shown in Figure 1d. Figure 1d. Jobs trends for R (blue & lower) and Python (orange & upper). 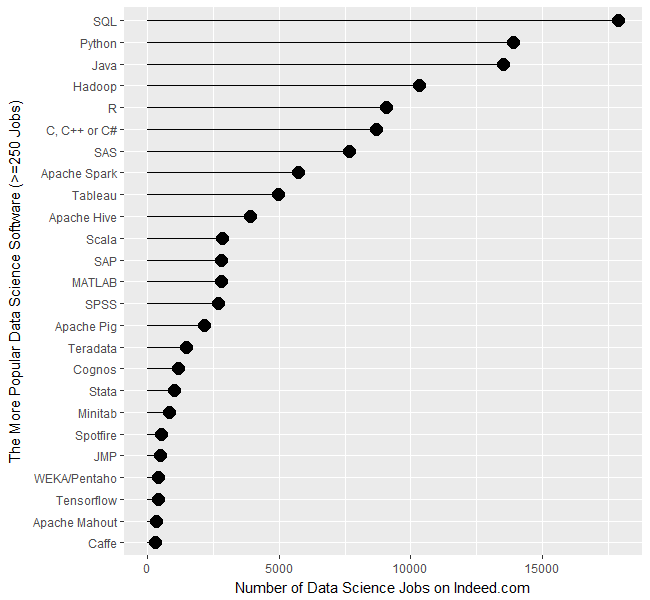 As we see, Python surpassed R in terms of data science jobs back in 2013. These are, of course, very different languages and a quick scan of job descriptions will show that the R jobs are much more focused on the use of existing methods of analysis, while the Python jobs have more of a custom-programming angle to them. Scholarly articles provide a rich source of information about data science tools. Because publishing requires significant amounts of effort, analyzing the type of data science tools used in scholarly articles provides a better picture of their popularity than a simple survey of tool usage. The more popular a software package is, the more likely it will appear in scholarly publications as an analysis tool, or even as an object of study. Since scholarly articles tend to use cutting-edge methods, the software used in them can be a leading indicator of where the overall market of data science software is headed. Google Scholar offers a way to measure such activity. However, no search of this magnitude is perfect; each will include some irrelevant articles and reject some relevant ones. The details of the search terms I used are complex enough to move to a companion article, How to Search For Data Science Articles. Since Google regularly improves its search algorithm, each year I collect data again for the previous years (with one exception noted below). Figure 2a shows the number of articles found for the more popular software packages and languages (those with at least 1,700 articles) in the most recent complete year, 2018. To allow ample time for publication, insertion into online databases, and indexing, the was data collected on 3/28/2019. Figure 2a. The number of scholarly articles found on Google Scholar, for data science software. Only those with more than 1,700 citations are shown. SPSS is by far the most dominant package, as it has been for over 20 years. This may be due to its balance between power and ease-of-use. R is in second place with around half as many articles. It offers extreme power, though with less ease of use. SAS is in third place, with a slight lead over Stata, MATLAB, and GraphPad Prism, which are nearly tied. Note that the general-purpose languages: C, C++, C#, FORTRAN, Java, MATLAB, and Python are included only when found in combination with data science terms, so view those counts as more of an approximation than the rest. The next group of packages goes from Python through C, with usage declining slowly. The next set starts at Caffe, dropping nearly 50%, and continuing to IBM Watson with a slow decline. The last two packages in Fig 2a are Weka and Theano, which are quite a drop from IBM Watson, though it’s getting harder to see as the lines shrink. To continue on this scale would make the remaining packages all appear too close to the y-axis to read, so Figure 2b shows the remaining software on a much smaller scale, with the y-axis going to only 1,700 rather than the 80,000 used on Figure 2a. Figure 2b. Number of scholarly articles using each data science software found using Google Scholar. Only those with fewer than 1,700 citations are shown. I chose to begin Figure 2b with software that has fewer than 1,700 articles because it allows us to see RapidMiner and KNIME on the same scale. They are both workflow-driven tools with very similar capabilities. This plot shows RapidMiner with 49% greater usage than KNIME. RapidMiner uses more marketing, while KNIME depends more on word-of-mouth recommendations and a more open source model. The IT advisory firms Gartner and Forrester rate them as tools able to hold their own against the commercial titans, IBM’s SPSS and SAS. Given that SPSS has roughly 50 times the usage in academia, that seems like quite a stretch. However, as we will soon see, usage of these newer packages are growing, while the use of the older ones is shrinking quite rapidly. Figure 2b also lets us see IBM’s SPSS Modeler, SAS Enterprise Miner, and Alteryx on the same plot. These three are also workflow-driven tools which are quite expensive. None are doing as well here as RapidMiner or KNIME, tools that much less expensive – or free – depending on how you use them (KNIME desktop is free but server is not; RapidMiner is free for analyzing fewer than 10,000 cases). Another interesting comparison on Figure 2b is JASP and jamovi. Both are open-source tools that focus on statistics rather than machine learning or artificial intelligence. They both use graphical user interfaces (GUIs) in a style that is similar to SPSS. Both also use R behind the scenes to do their calculations. JASP emphasizes Bayesian Analysis and hides its R code; jamovi has a more frequentist orientation, it lets you see its R code and it lets you execute your own R code directly from within it. JASP currently has nine times as many citations here, though jamovi’s use is growing much more rapidly. Even newer on the GUI for R scene is BlueSky Statistics, which doesn’t appear on the plot at all since it has zero scholarly articles so far. It was created by a new company and only adopted an open source model a few months ago. While Figures 2a and 2b are useful for studying market share as it stands now, they don’t show how things are changing. It would be ideal to have long-term growth trend graphs for each of the analytics packages, but collecting that much data annually is too time-consuming. What I’ve done instead is collect data only for the past two complete years, 2017 and 2018. This provides the data needed to study year-over-year changes. Figure 2c shows the percent change across those years, with the growing “hot" packages shown in red (right side); the declining or “cooling" are shown in blue (left side). Since the number of articles tends to be in the thousands or tens of thousands, I have removed any software that had fewer than 1,000 articles in 2015. A package that grows from 1 article to 5 may demonstrate 500% growth but is still of little interest. Figure 2c. Change in Google Scholar citation rate in the most recent complete two years, 2017 and 2018. The recent changes in data science software can be summarized succinctly: AI/ML up; statistics down. The software that is growing contains none of the packages that are associated more with statistical analysis. The software in decline is dominated by the classic packages of statistics: SPSS Statistics, SAS, GraphPad Prism, Stata, Statgraphics, R, Statistica, Systat, and Minitab. JMP is the only traditional statistics package whose scholarly usage is growing. Of the machine learning software that’s declining in usage, there are rough equivalents that are growing (e.g. Mahout down, Spark up). Of course another summary is: cheap (or free) up; expensive down. Of the growing packages, 13 out of 17 are available in open source. Of those in decline, only 5 out of 13 are open source. Statistics software has been around much longer than AI/ML software, started back in the days before open source. Stat vendors have been adding AI/ML methods to their software, making them the more comprehensive solutions. The AI/ML vendors or projects are missing an opportunity to add more comprehensive statistics capabilities. Some, such as RapidMiner and KNIME, are indeed expanding in this direction, but very slowly indeed. At the top of Figure 2c, we see that the deep learning packages Keras and TensorFlow are the fastest growing at nearly 150%. PyTorch is not shown here because it did not have enough usage in the previous year. However, its citation rate went from 616 to 4,670, a substantial 658% growth rate! There are other packages that are not shown here, including JASP with 223% growth, and jamovi with 720% growth. Despite such high growth, the latter still only has 108 citations in 2018. The rapid growth of JASP and jamovi lend credence to the perspective that the overall pattern of change shown in Figure 2c may be more of a result of free vs. expensive software. Neither of them offers any AI/ML features. Scikit Learn, the Python machine learning library, was a fast grower with a 60% increase. I was surprised to see IBM Watson growing a healthy 34% as much of the news about it has not been good. It’s awesome at Jeopardy though! In the RapidMiner vs. KNIME contest, we saw previously that RapidMiner was ahead. From this plot, we that KNIME growing slightly (5.7%) while RapidMiner is declining slightly (1.8%). The biggest losers in Figure 2c are SPSS, down 39%, and SAS, Prism, and Mahout, all down 24%. Even R is down 13%. 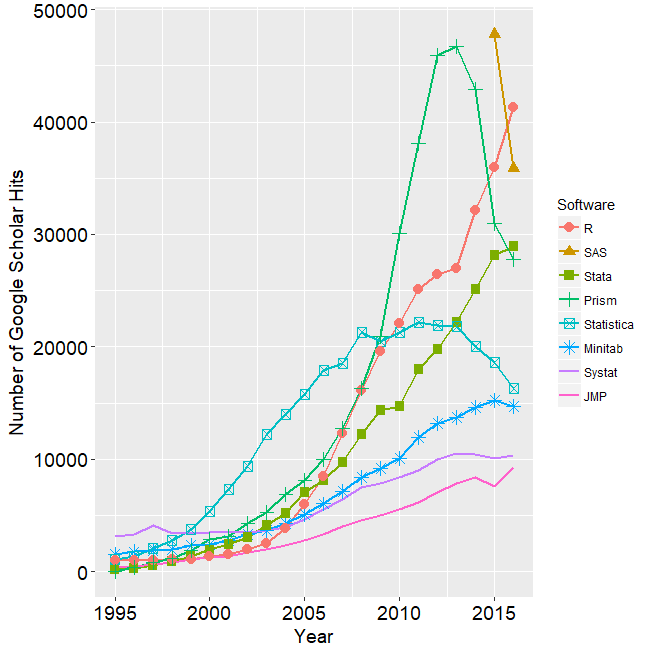 Recall that Figure 2a shows that despite recent years of decline, SPSS is still extremely dominant for scholarly use, and R and SAS are still the #2 and #3 most widely used packages in this arena. I’m particularly interested in the long-term trends of the classic statistics packages. So in Figure 2d I have plotted the same scholarly-use data for 1995 through 2016. Figure 2d. The number of Google Scholar citations for each classic statistics package per year from 1995 through 2016. SPSS has a clear lead overall, but now you can see that its dominance peaked in 2009 and its use is in sharp decline. SAS never came close to SPSS’ level of dominance, and its use peaked around 2010. GraphPAD Prism followed a similar pattern, though it peaked a bit later, around 2013. In Figure 2d, the extreme dominance of SPSS makes it hard to see long-term trends in the other software. To address this problem, I have removed SPSS and all the data from SAS except for 2014 and 1015. The result is shown in Figure 2e. Figure 2e. The number of Google Scholar citations for each classic statistics package from 1995 through 2016, this time with SPSS removed and SAS included only in 2014 and 2015. The removal of SPSS and SAS expanded scale makes it easier to see the rapid growth of the less popular packages. Figure 2e makes it easy to see that most of the remaining packages grew steadily across the time period shown. R and Stata grew especially fast, as did Prism until 2012. 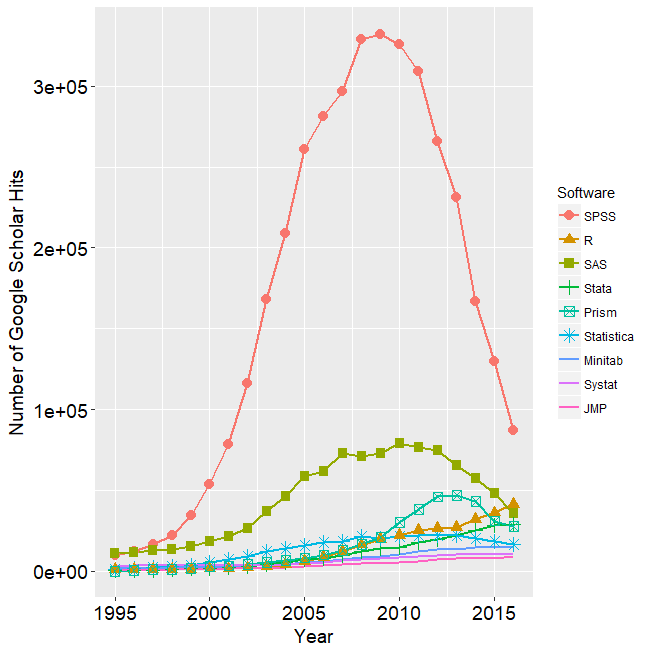 Note that the decline in the number of articles that used SPSS, SAS, or Prism is not balanced by the increase in the other software shown in this particular graph. Even adding up all the other software shown in Figures 2a and 2b doesn’t account for the overall decline. However, I’m looking at only 58 out of over 100 data science tools. While Figures 2d and 2e show the historical trend that ended in 2016, Figure 2f shows a fresh set of data collected in March, 2019. Since Google’s algorithm changes, preventing the new data from matching exactly with the old, this new data starts at 2015 so the two sets overlap. SPSS is not shown on this graph because its dominance would compress the y-axis, making trends in the others harder to see. However, keep in mind that despite SPSS’ 39% drop from 2017 to 2018, its use is still 66% higher than R in 2018! Apparently people are willing to pay for ease of use. Figure 2f. The number of Google Scholar citations for each classic statistics package per year from 2015 through 2018. In Figure 2f we can see that the downward trends of SAS, Prism, and Statistica are continuing. We also see that the long and rapid growth of R and Stata has come to an end. Growth that rapid can’t go on forever. It will be interesting to see next year to see if this is merely a flattening of usage or the beginning of a declining trend. As I pointed out in my book, R for Stata Users, there are many commonalities between R and Stata. As a result of this, and the fact that R is open source, I expect R use to stabilize at this level while use of Stata continues to slowly decline. SPSS’ long-term rapid decline has to level out at some point. They have been chipped away at by many competitors. However, until recently these competitors have either been free and code-based such as R, or menu-based and proprietary, such as Prism. With the fairly recent arrival of JASP, jamovi, and BlueSky Statistics, SPSS now faces software that is both free and menu-based. Previous projects to add menus to R, such as the R Commander and Deducer, were also free and open source, but they required installing R separately and then using R code to activate the menus. These results apply to scholarly articles in general. The results in specific fields or journals are very likely to be different. IT research firms study software products and corporate strategies. They survey customers regarding their satisfaction with the products and services and provide their analysis in reports that they sell to their clients. Each research firm has its own criteria for rating companies, so they don’t always agree. However, I find the detailed analysis that these reports contain extremely interesting reading. The reports exclude open source software that has no specific company backing, such as R, Python, or jamovi. Even open source projects that do have company backing, such as BlueSky Statistics, are excluded if they have yet to achieve sufficient market adoption. However, they do cover how company products integrate open source software into their proprietary ones. While these reports are expensive, the companies that receive good ratings usually purchase copies to give away to potential customers. An Internet search of the report title will often reveal the companies that are distributing such free copies. Gartner, Inc. is one of the research firms that write such reports. Out of the roughly 100 companies selling data science software, Gartner selected 17 which offered “cohesive software.” Such software performs a wide range of tasks including data importation, preparation, exploration, visualization, modeling, and deployment. Gartner analysts rated the companies on their “completeness of vision” and their “ability to execute” that vision. Figure 3a shows the resulting “Magic Quadrant” plot for 2019, and 3b shows the plot for the previous year. Here I provide some commentary on their choices, briefly summarize their take, and compare this year’s report to last year’s. The main reports from both years contain far more detail than I cover here. Figure 3a. Gartner Magic Quadrant for Data Science and Machine Learning Platforms from their 2019 report (plot done in November 2018, report released in 2019). The Leaders quadrant is the place for companies whose vision is aligned with their customer’s needs and who have the resources to execute that vision. The further toward the upper-right corner of the plot, the better the combined score. RapidMiner and KNIME reside in the best part of the Leaders quadrant this year and last. This year RapidMiner has the edge in ability to execute, while KNIME offers more vision. Both offer free and open source versions, but the companies differ quite a lot on how committed they are to the open source concept. KNIME’s desktop version is free and open source and the company says it will always be so. On the other hand, RapidMiner is limited by a cap on the amount of data that it can analyze (10,000 cases) and as they add new features, they usually come only via a commercial license with “difficult-to-navigate pricing conditions.” These two offer very similar workflow-style user interfaces and have the ability to integrate many open sources tools into their workflows, including R, Python, Spark, and H2O. Tibco moved from the Challengers quadrant last year to the Leaders this year. This is due to a number of factors, including the successful integration of all the tools they’ve purchased over the years, including Jaspersoft, Spotfire, Alpine Data, Streambase Systems, and Statistica. SAS declined from being solidly in the Leaders quadrant last year to barely being in it this year. This is due to a substantial decline in its ability to execute. Given SAS Institute’s billions in revenue, that certainly can’t be a financial limitation. It may be due to SAS’ more limited ability to integrate as wide a range of tools as other vendors have. The SAS language itself continues to be an important research tool among those doing complex mixed-effects linear models. Those are models are among the very few that R often fails to solve. The companies in the Visionaries Quadrant are those that have good future plans but which may not have the resources to execute that vision. Mathworks moved forward substantially in this quadrant due to MATLAB’s ability to handle unconventional data sources, such as images, video, and the Internet of Things (IoT). It has also opened up more to open source deep learning projects. H2O.ai is also in the Visionaries quadrant. This is the company behind the open source H2O software, which is callable from many other packages or languages including R, Python, KNIME, and RapidMiner. While its own menu-based interface is primitive, its integration into KNIME and RapidMiner makes it easy to use for non-coders. H2O’s strength is in modeling but it is lacking in data access and preparation, as well as model management. IBM dropped from the top of the Visionaries quadrant last year to the middle. The company has yet to fully integrate SPSS Statistics and SPSS Modeler into its Watson Studio. IBM has also had trouble getting Watson to deliver on its promises. Databricks improved both its vision and its ability to execute, but not enough to move out of the Visionaries quadrant. It has done well with its integration of open-source tools into its Apache Spark-based system. However, it scored poorly in the predictability of costs. Datarobot is new to the Gartner report this year. As its name indicates, its strength is in the automation of machine learning, which broadens its potential user base. The company’s policy of assigning a data scientist to each new client gets them up and running quickly. Google’s position could be clarified by adding more dimensions to the plot. Its complex collection of a dozen products that work together is clearly aimed at software developers rather than data scientists or casual users. Simply figuring out what they all do and how they work together is a non-trivial task. In addition, the complete set runs only on Google’s cloud platform. Performance on big data is its forte, especially problems involving image or speech analysis/translation. Microsoft offers several products, but only its cloud-only Azure Machine Learning was comprehensive enough to meet Gartner’s inclusion criteria. Gartner gives it high marks for ease-of-use, scalability, and strong partnerships. However, it is weak in automated modeling and AML’s relation to various other Microsoft components is overwhelming (same problem as Google’s toolset). Those in the Challenger’s Quadrant have ample resources but less customer confidence on their future plans, or vision. 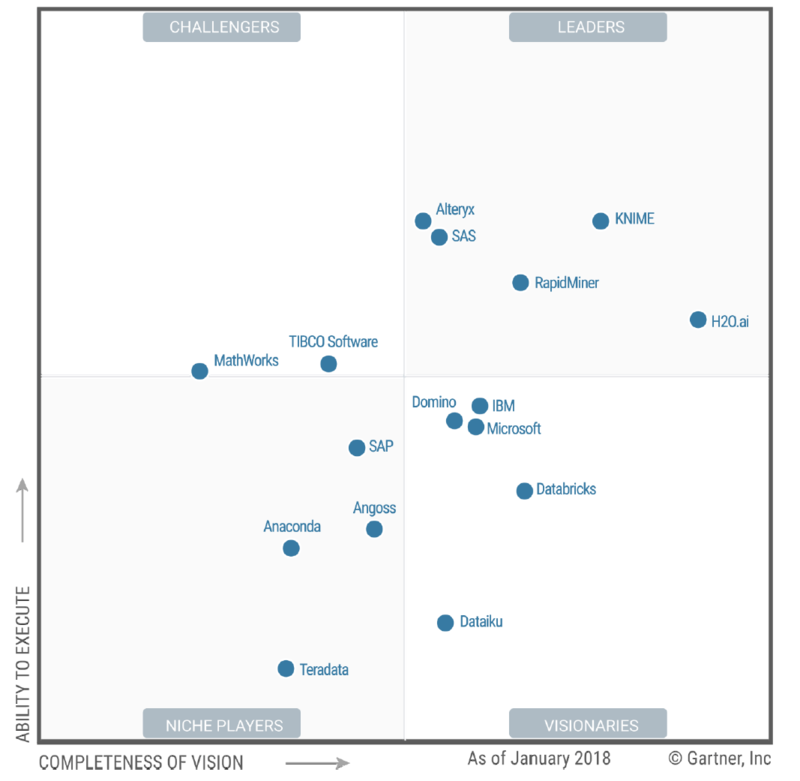 Alteryx dropped slightly in vision from last year, just enough to drop it out of the Leaders quadrant. Its workflow-based user interface is very similar to that of KNIME and RapidMiner, and it too gets top marks in ease-of-use. It also offers very strong data management capabilities, especially those that involve geographic data, spatial modeling, and mapping. It comes with geo-coded datasets, saving its customers from having to buy it elsewhere and figuring out how to import it. However, it has fallen behind in cutting edge modeling methods such as deep learning, auto-modeling, and the Internet of Things. Members of the Niche Players quadrant offer tools that are not as broadly applicable. These include Anaconda, Datawatch (includes the former Angoss), Domino, and SAP. Anaconda provides a useful distribution of Python and various data science libraries. They provide support and model management tools. The vast army of Python developers is its strength, but lack of stability in such a rapidly improving world can be frustrating to production-oriented organizations. This is a tool exclusively for experts in both programming and data science. Datawatch offers the tools it acquired recently by purchasing Angoss, and its set of “Knowledge” tools continues to get high marks on ease-of-use and customer support. However, it’s weak in advanced methods and has yet to integrate the data management tools that Datawatch had before buying Angoss. Domino Data Labs offers tools aimed only at expert programmers and data scientists. It gets high marks for openness and ability to integrate open source and proprietary tools, but low marks for data access and prep, integrating models into day-to-day operations, and customer support. SAP’s machine learning tools integrate into its main SAP Enterprise Resource Planning system, but its fragmented toolset is weak, and its customer satisfaction ratings are low. Forrester Research, Inc. is a leading global research and advisory firm that reviews data science software vendors. Studying their reports and comparing them to Gartner’s can provide a deeper understanding of the software these vendors provide. Historically, Forrester has conducted their analyses similarly to Gartner’s. That approach compares software that uses point-and-click style software like KNIME, to software that emphasizes coding, such as Anaconda. To make apples-to-apples comparisons, Forrester decided to spit the two types of software into separate reports. The Forrester Wave: Multimodal Predictive Analytics and Machine Learning Solutions, Q3, 2018 covers software that is controllable by various means such as menus, workflows, wizards, or code (as of 23/22/2019 available free here). Forrester plans to cover tools for automated modeling in a separate report, due out in 2019. Given that automation is now a widely adopted feature of the several companies covered in this report, that seems like an odd approach. Forrester divides the vendors into four categories: Leaders, Strong Performers, Contenders, and Challengers. In the Leaders category, they include IBM, while Gartner viewed them as a middle-of-the-pack Visionary. Forrester and Gartner both view SAS and RapidMiner as leaders. The Strong Performers category includes KNIME, which Gartner considered a Leader. Datawatch and Tibco are tied in this segment while Gartner had them far apart, with Datawatch put in very last place by Gartner. Forrester has KNIME and SAP next to each other in this category, while Gartner had them far apart, with KNIME a Leader and SAP a Niche Player. Dataiku is here too, with a similar rating to Gartner. The Contenders segment contains Microsoft and Mathworks, in positions similar to Gartner’s. Fico is here too; Gartner did not evaluate them. Forrester’s Challengers segment includes World Programming, which sells SAS-compatible software, and Minitab, which purchased Salford Systems. Neither were considered by Gartner. The Forrester Wave: Notebook-Based Solutions, Q3, 2018 reviews software controlled by notebooks, which blend programming code and output in the same window (as of 3/22/2019 available here). Forrester rates some of the notebook-based vendors very differently than Gartner. Here Domino Data Labs is a Leader while Gartner had them at the extreme other end of their plot, in the Niche Players quadrant. Oracle is also shown as a Leader, though its strength is this market is minimal. In the Strong Performers category are Databricks and H2O.ai, in very similar positions compared to Gartner. Civis Analytics and OpenText are also in this category; neither were reviewed by Gartner. Cloudera is here as well; it too was left out by Gartner. Forrester’s Condenders category contains Google, in a similar position compared to Gartner’s analysis. Anaconda is here too, in a position quite a bit higher than in Gartner’s plot. The only two companies rated by Gartner but ignored by Forrester are Alteryx and DataRobot. The latter will no doubt be covered in Forrester’s report on automated modelers, due out this summer. As with my coverage of Gartner’s report, my summary here barely scratches the surface of the two Forrester reports. Both provide insightful analyses of the vendors and the software they create. I recommend reading both (and learning more about open source software) before making any purchasing decisions. Survey data adds additional information regarding software popularity, but they are commonly done using “snowball sampling” in which the survey provider tries to widely distribute the link and then vendors vie to see who can get the most of their users to participate. So long as they all do so with equal effect, the results can be useful. However, the information is often limited, because the questions are short and precise (e.g. “tools for data mining” or “program languages for data mining”) and responding requires just a few mouse clicks, rather than the commitment required to place a job advertisement or publish a scholarly article, book, or blog post. As a result, it’s not unusual to see market share jump 100% or drop 50% in a single year, which is very unlikely to reflect changes in actual use. Rexer Analytics conducts a survey of data scientists every other year, asking a wide range of questions regarding data science (previously referred to as data mining by the survey itself.) Figure 4a shows the tools that the 1,220 respondents reported using in 2015. Figure 4a. Analytics tools used by respondents to the 2015 Rexer Analytics Survey. In this view, each respondent was free to check multiple tools. We see that R has a more than 2-to-1 lead over the next most popular packages, SPSS Statistics and SAS. Microsoft’s Excel Data Mining software is slightly less popular, but note that it is rarely used as the primary tool. Tableau comes next, also rarely used as the primary tool. That’s to be expected as Tableau is principally a visualization tool with minimal capabilities for advanced analytics. The next batch of software appears at first to be all in the 15% to 20% range, but KNIME and RapidMiner are listed both in their free versions and, much further down, in their commercial versions. These data come from a “check all that apply” type of question, so if we add the two amounts, we may be over counting. However, the survey also asked, “What one (my emphasis) data mining / analytic software package did you use most frequently in the past year?” Using these data, I combined the free and commercial versions and plotted the top 10 packages again in figure 4b. Since other software combinations are likely, e.g. SAS and Enterprise Miner; SPSS Statistics and SPSS Modeler; etc. I combined a few others as well. Figure 4b. The percent of survey respondents who checked each package as their primary tool in 2015. Note that free and commercial versions of KNIME and RapidMiner are combined. Multiple tools from the same company are also combined. Only the top 10 are shown. In this view we see R even more dominant, with a 3-to-1 advantage compared to the software from IBM SPSS and SAS Institute. However, the overall ranking of the top three didn’t change. KNIME however rises from 9th place to 4th. RapidMiner rises as well, from 10th place to 6th. KNIME has roughly a 2-to-1 lead over RapidMiner, even though these two packages have similar capabilities and both use a workflow user interface. This may be due to RapidMiner’s move to a more commercially oriented licensing approach. For free, you can still get an older version of RapidMiner or a version of the latest release that is quite limited in the types of data files it can read. Even the academic license for RapidMiner is constrained by the fact that the company views “funded activity” (e.g. research done on government grants) the same as commercial work. The KNIME license is much more generous as the company makes its money from add-ons that increase productivity, collaboration and performance, rather than limiting analytic features or access to popular data formats. The results of a similar poll done by the KDnuggets.com web site in May of 2015 are shown in Figure 4c. This one shows R in first place with 46.9% of users reporting having used it for a “real project.” RapidMiner, SQL, and Python follow quite a bit lower with around 30% of users. Then at around 20% are Excel, KNIME and HADOOP. It’s interesting to see that these survey results reverse the order in the previous one, showing RapidMiner as being more popular than KNIME. Both are still the top two “point-and-click” type packages generally used by non-programmers. Figure 4c. Percent of respondents that used each software in KDnuggets’ 2015 poll. Only software with 5% market share are shown. The % alone is the percent of tool voters that used only that tool alone. For example, only 3.6% of R users have used only R, while 13.7% of RapidMiner users indicated they used that tool alone. Years are color coded, with 2015, 2014, 2013 from top to bottom. O’Reilly Media conducts an annual Data Science Salary Survey which also asks questions about analytics tools. Although the full report of results As their report notes,”O’Reilly content—in books, online, and at conferences—is focused on technology, in particular new technology, so it makes sense that our audience would tend to be early adopters of some of the newer tools.” The results from their “over 600” respondents are shown in figures 6d and 6e. Figure 4d. Tools used by 2015 respondents to O’Reilly 2015 salary survey. The less popular tools among this audience are shown in the following figure. Figure 4e. The less popular tools used by the respondents of O’Reilly’s 2015 salary survey. Lavastorm, Inc. conducted a survey of analytic communities including LinkedIn’s Lavastorm Analytics Community Group, Data Science Central and KDnuggets. The results were published in March, 2013, and the bar chart of “self-service analytic tool” usage among their respondents is shown in Figure 6f. Excel comes out as the top tool, with 75.6% of respondents reporting its use. R comes out as the top advanced analytics tool with 35.3% of respondents, followed closely by SAS. MS Access’ position in 4th place is a bit of an outlier as no other surveys include it at all. Lavastorm comes out with 3.4%, while other surveys don’t show them at all. That’s hardly a surprise given than the survey was aimed at the Lavastorm’s LinkedIn community group. Figure 4f. Lavastorm survey of analytics tools. The number of books that include a software’s name in its title is a particularly useful information since it requires a significant effort to write one and publishers do their own study of market share before taking the risk of publishing. However, it can be difficult to do searches to find books that use general-purpose languages which also focus only on analytics. Amazon.com offers an advanced search method which works well for all the software except R and the general-purpose languages such as Java, C, and MATLAB. I did not find a way to easily search for books on analytics that used such general purpose languages, so I’ve excluded them in this section. The “title” parameter allowed me to focus the search on books that included the software names in their titles. Other books may use a particular software in their examples, but they’re impossible to search for easily. SAS has many manuals for sale as individual chapters or excerpts. They contain “chapter" or “excerpt" in their title so I excluded them using the minus sign, e.g. “-excerpt". SAS also has short “changes and enhancements" booklets that the developers of other packages release only in the form of flyers and/or web pages, so I excluded “changes" as well. Some software listed brief “articles” which I also excluded. I did the search on June 1, 2015, and I excluded excerpts, chapters, changes, and articles from all searches. “R” is a difficult term to search for since it’s used in book titles to indicate Registered Trademark as in “SAS(R)”. Therefore I verified all the R books manually. The results are shown in the table immediately below, where it’s clear that a very small number of analytics software packages dominate the world of book publishing. SAS has a huge lead with 576 titles, followed by SPSS with 339 and R with 240. SAS and SPSS both have many versions of the same book or manual still for sale, so their numbers are both inflated as a result. JMP and Hadoop both had fewer than half of R’s count and then Minitab and Enterprise Miner had fewer then half again as many. Although I obtained counts on all 27 of the domain-specific (i.e. not general-purpose) analytics software packages or languages shown in Figure 2a, I cut the table off at software that had 8 or fewer books to save space. Table 1. The number of books whose titles contain the name of each software package. On Internet blogs, people write about software that interests them, showing how to solve problems and interpreting events in the field. Blog posts contain a great deal of information about their topic, and although it’s not as time consuming as a book to write, maintaining a blog certainly requires effort. Therefore, the number of bloggers writing about analytics software has potential as a measure of popularity or market share. Unfortunately, counting the number of relevant blogs is often a difficult task. General purpose software such as Java, Python, the C language variants and MATLAB have many more bloggers writing about general programming topics than just analytics. But separating them out isn’t easy. The name of a blog and the title of its latest post may not give you a clue that it routinely includes articles on analytics. and the source of the data. R’s 550 blogs is quite an impressive number. For Python, I could only find that list of 60 that were devoted to the SciPy subroutine library. Some of those are likely cover topics besides analytics, but to determine which never cover the topic would be quite time consuming. The 40 blogs about SAS is still an impressive figure given that Stata was the only other company that even garnered a list anywhere. That list is at the vendor itself, Statacorp, but it consists of non-employees except for one. While searching for lists of blogs on other software, I did find individual blogs that at least occasionally covered a particular topic. However, keeping this list up to date is far too time consuming given the relative ease with which other popularity measures are collected. If you know of other lists of relevant blogs, please let me know and I’ll add them. If you’re a software vendor employee reading this, and your company does not build a metablog or at least maintain a list of your bloggers, I recommend taking advantage of this important source of free publicity. Another way to measure software popularity is to see how many people are helping one another use each package or language. While such data is readily available, it too has its problems. Menu-driven software like SPSS or workflow-driven software such as KNIME are quite easy to use and tend to generate fewer questions. Software controlled by programming requires the memorization of many commands and requiring more support. Even within languages, some are harder to use than others, generating more questions (see Why R is Hard to Learn). Another problem with this type of data is that there are many places to ask questions and each has its own focus. Some are interested in a classical statistics perspective while others have a broad view of software as general-purpose programming languages. In recent years, companies have set up support sites within their main corporate web site, further splintering the places you can go to get help. Usage data for such sites is not readily available. Another problem is that it’s not as easy to use logic to focus in on specific types of questions as it was with the data from job advertisements and scholarly articles discussed earlier. It’s also not easy to get the data across time to allow us to study trends. Finally, the things such sites measure include: software group members (a.k.a. followers), individual topics (a.k.a. questions or threads), and total comments across all topics (a.k.a. total posts). This makes combining counts across sites problematic. Figure 7a. Number of people who follow each software on LinkedIn and Quara. We see that R is the dominant software and that moving down through SAS, SPSS, and Stata results in a loss of roughly half the number of people in each step. Lavastorm follows Stata, but I find it odd that there was absolutely zero discussion of Lavastorm on Quora. The last bar that you can even see on this plot is the 62 people who follow Minitab. All the ones below that have tiny audiences of fewer than 10. Figure 7b. Number of questions and for each software on Talk Stats and Cross Validated. Those not shown had no questions. We see that R has a 4-to-1 lead over the next most popular package, SPSS. Stata comes in at 3rd place, followed by SAS. The fact that SAS is in fourth place here may be due to the fact that it is strong in data management and report writing, which are not the types of questions that these two sites focus on. Although MATLAB and Python are general purpose languages, I include them here because the questions on this site are within the realm of analytics. Note that I collected data on as many packages as were shown in the previous graph, but those not shown have a count of zero. Julia appears to have a count of zero due to the scale of the graph, but it actually had 5 questions on Cross Validated. Several web sites rank the popularity of programming languages. Unfortunately, they don’t differentiate between general-purpose languages and application-specific ones used for analytics. However, it’s easy to choose the few analytics languages their results. Figure 8a. IEEE Spectrum language popularity rankings. The left column (orange) shows the 2015 ranking, while the right (yellow) one shows the 2014 ranking. We see that R is in 6th place and that it has increased from 9th place in 2014. Not shown on this is SAS in 26th place. Python is ranked in 4th place, but that’s for all purposes, while the use of R is more focused on analytics. No other analytics-specific language makes it in their rankings at all. This ranking is based on a weighted composite score and the site is interactive, allowing you to generate a ranking more suited to your needs. Figure 8b. RedMonkpProgramming language popularity as measured by number of projects on GitHub and the amount of discussion on StackOverflow. Moving from the upper right corner downward the lower left, we can see that Redmonk’s approach shows R as a very popular language, around 12th place. Although a substantial amount of the metrics for Python, MATLAB, and Julia may be due to analytics use, we have no way of knowing how much. The TIOBE Community Programming Index also ranks the popularity of programming languages. It extracts measurements from the 25 most popular search engines including Google, YouTube, Wikipedia, Amazon.com, and combines them into a single index. In their October 2015 rankings, they place R in 20th place and SAS in 23rd. Stata is in a bundle they call “the next 50” languages, whose popularity among general-purpose languages is so sparse that their relative rankings are too unstable to bother giving individual ranks. SPSS is a language they monitor, but it doesn’t make it into their top 100. This brings us to an important limitation of the Tiobe index: it searches for one single string: “X programming.” So if it didn’t find “SPSS programming” then it doesn’t count. The complex searches that I used for jobs and scholarly articles was far more useful in estimating each package’s popularity. Another limitation to the Tiobe index is that it measures what is on the Internet now, so it’s a lagging indicator. There’s no way to plot trends without purchasing their data, which is quite expensive. A very similar popularity index is PYPL PopularitY of Programming Language. It only tracks the top 15 languages and, in October of 2015 it placed R in 11th place. It searches on the single string, “X tutorial” making it a leading indicator of what’s likely to be more popular in the future. The Transparent Language Popularity Index is very similar to the TIOBE Index with except that its ranking software, algorithm and data are published for all to see. Work on this index ceased as of July, 2013. Sales figures reported by some commercial vendors include products that have little to do with analysis. Many vendors don’t release sales figures, or they release them in a form that combines many different products, making the examination of a particular product impossible. For open source software such as R, you could count downloads, but one confused person can download many copies, inflating the total. Conversely, many people can use a single download on a server, deflating it. Download counts for the R-based Bioconductor project are located here. Similar figures for downloads of Stata add-ons (not Stata itself) are available here. A list of Stata repositories is available here. The many sources of downloads both in repositories and individuals’ web sites makes counting downloads a very difficult task. Kaggle.com is a web site that sponsors data science contests. People post problems there along the amount of money they are willing pay the person or team who solves their problem the best. Both money and the competitors’ reputations are on the line, so there’s strong motivation to use the best possible tools. Figure 9 compares the usage of the top two tools chosen by the data scientists working on the problems. 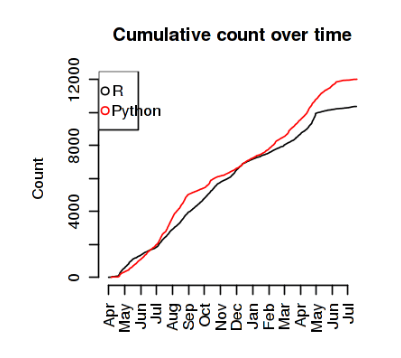 From April 2015 through July 2016, we see the usage of both R and Python growing at a similar rate. 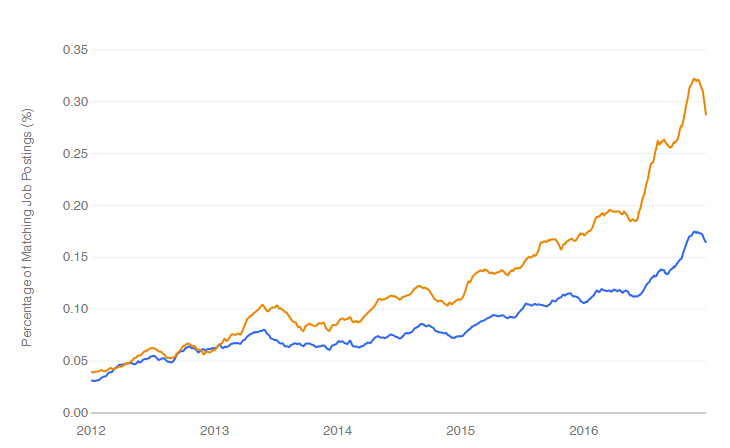 At the most recent time point Python has pulled ahead slightly. Much more detail is available here. Figure 9. Software used in data science competitions on Kaggle.com in 2015 and 2016. The capability of analytics software has grown significantly over the years. It would be helpful to be able to plot the growth of each software package’s capabilities, but such data are hard to obtain. John Fox (2016) acquired them for R’s main distribution site http://cran.r-project.org/ for each version of R. To simplify ongoing data collection, I kept only the values for the last version of R released each year (usually in November or December), and collected data through the most recent complete year. These data are displayed in Figure 10. The right-most point is for version 3.2.3, released 12/10/2015. The growth curve follows a rapid parabolic arc (quadratic fit with R-squared=.995). Figure 10. Number of R packages available on its main distribution site for the last version released in each year. To put this astonishing growth in perspective, let us compare it to the most dominant commercial package, SAS. In version, 9.3, SAS contained around 1,200 commands that are roughly equivalent to R functions (procs, functions, etc. in Base, Stat, ETS, HP Forecasting, Graph, IML, Macro, OR, and QC). In 2015, R added 1,357 packages, counting only CRAN, or approximately 27,642 functions. During 2015 alone, R added more functions/procs than SAS Institute has written in its entire history. Of course while SAS and R commands solve many of the same problems, they are certainly not perfectly equivalent. Some SAS procedures have many more options to control their output than R functions do, so one SAS procedure may be equivalent to many R functions. On the other hand, R functions can nest inside one another, creating nearly infinite combinations. SAS is now out with version 9.4 and I have not repeated the arduous task of recounting its commands. If SAS Institute would provide the figure, I would include it here. While the comparison is far from perfect, it does provide an interesting perspective on the size and growth rate of R.
As rapid as R’s growth has been, these data represent only the main CRAN repository. R has eight other software repositories, such as Bioconductor, that are not included in Fig. 10. A program run on 4/19/2016 counted 11,531 R packages at all major repositories, 8,239 of which were at CRAN. (I excluded the GitHub repository since it contains duplicates to CRAN that I could not easily remove.) So the growth curve for the software at all repositories would be approximately 40% higher on the y-axis than the one shown in Figure 10. As with any analysis software, individuals also maintain their own separate collections available on their web sites. However, those are not easily counted. What’s the total number of R functions? The Rdocumentation site shows the latest counts of both packages and functions on CRAN, Bioconductor and GitHub. They indicate that there is an average of 19.78 functions per package. Given the package count of 11,531, as of 4/19/2016 there were approximately 228,103 total functions in R. In total, R has approximately 190 times as many commands as its main commercial competitor, SAS. I previously included graphs from Google Trends. That site tracks not what’s actually on the Internet via searches, but rather the keywords and phrases that people are entering into their Google searches. That ended up being so variable as to be essentially worthless. For an interesting discussion of this topic, see this article by Rick Wicklin. Website Popularity – in previous editions I have included measures of this. However, as the corporate landscape has consolidated, we end up comparing huge companies with interests far outside the field of analytics (e.g. IBM) with relatively small focused ones, which no longer makes sense. Although the ranking of each package varies depending on the criteria used, we can still see major trends. Among the software that tends to be used as a collection of pre-written methods, R, SAS, SPSS and Stata tend to always be in the top, with R and SAS occasionally swapping places depending on the criteria used. I don’t include Python in this group as I rarely see someone using it exclusively to call pre-written routines. Among software that tends to be used as a language for analytics, C/C#/C++, Java, MATLAB, Python, R and SAS are always towards the top. I list those in alphabetical order since many of the measures cover not only use for analytics but for other uses as well. Among my colleagues, those who are more towards the computer science side of the data science field tend to prefer Python, while those who are more towards the statistics send tend to prefer R. A language worth mentioning is Julia, whose goal is to have syntax as clean as Pythons while maintaining the top speed reached by the C/C#/C++ group. A trend that I find very interesting is the rise of software that uses the workflow (or flowchart) style of control. While menu-driven software is easy to learn, it’s not easy to re-use the work. Workflow-driven software is almost as easy — the dialog boxes that control each node are almost identical to menu-driven software — but you also get to save and re-use the work. Software that uses this approach includes: KNIME, Microsoft Azure Machine Learning, RapidMiner, SPSS Modeler (the first to popularize this approach), SAS Enterprise Miner, SAS Studio, and even two cloud-based system that I have not been tracking, Dotplot Designer and Microsoft Azure Machine Learning. The wide use of this interface is allowing non-programmers to make use of advanced analytics. I’m interested in other ways to measure software popularity. If you have any ideas on the subject, please contact me at muenchen.bob@gmail.com. If you are a SAS or SPSS user interested in learning more about R, you might consider my book, R for SAS and SPSS Users. Stata users might want to consider reading R for Stata Users, which I wrote with Stata guru Joe Hilbe. I also teach workshops on these topics both online and with site visits. I am grateful to the following people for their suggestions that improved this article: John Fox (2009) provided the data on R package growth; Marc Schwartz (2009) suggested plotting the amount of activity on e-mail discussion lists; Duncan Murdoch clarified the pitfalls of counting downloads; Martin Weiss pointed out both how to query Statlist for its number of subscribers; Christopher Baum provided information regarding counting Stata downloads; John (Jiangtang) HU suggested I add more detail from the TIOBE index; Andre Wielki suggested the addition of SAS Institute’s support forums; Kjetil Halvorsen provided the location of the expanded list of Internet R discussions; Dario Solari and Joris Meys suggested how to improve Google Insight searches; Keo Ormsby provded useful suggestions regarding Google Scholar; Karl Rexer provided his data mining survey data; Gregory Piatetsky-Shapiro provided his KDnuggets data mining poll; Tal Galili provided advice on blogs and consolidation, as well as Stack Exchange and Stack Overflow; Patrick Burns provided general advice; Nick Cox clarified the role of Stata’s software repositories and of popularity itself; Stas Kolenikov provided the link of known Stata repositories; Rick Wicklin convinced me to stop trying to get anything useful out of Google Insights; Drew Schmidt automated some of the data collection; Peter Hedström greatly improved my search string for Stata; Rudy Richardson pointed out that GraphPad Prism is widely used for statistical analysis; Josh Price and Janet Miles provided expert editorial advice. R. Ihaka and R. Gentleman. R: A language for data analysis and graphics. Journal of Computational and Graphical Statistics, 5:299–314, 1996. Alpine, Alteryx, Angoss, Microsoft C#, BMDP, IBM SPSS Statistics, IBM SPSS Modeler, InfoCentricity Xeno, Oracle’s Java, SAS Institute’s JMP, KNIME, Lavastorm, Mathworks’ MATLAB, Megaputer’s PolyAnalyst, Minitab, NCSS, Python, R, RapidMiner, SAS, SAS Enterprise Miner, Salford Predictive Modeler (SPM) etc., SAP’S KXEN, Stata, Statistica, Systat, WEKA / Pentaho are are registered trademarks of their respective companies. Copyright 2010-2019 Robert A. Muenchen, all rights reserved. i’m not surprised that R, in particular, has done spectacularly well with respect to analytic use – it has, as best i can tell, virtually all the analytic tools one might need. I’ve been worried for decades now about the ever increasing use of excel for both data mgt and analysis. So many projects/”data sets”/ analyses have come our way in excel spreadsheets only for major problems in data integrity, tracing flow of data changes that led to errors, even analyses that were later found to be completely hosed because a user had done something as simple, and as deadly, as sorting a column instead of the records/rows. I’ve done quite a lot of complex data management in SAS, SPSS and R. To me they seem quite similar in capability except that R must fit the data into the computer’s main memory (unless you’re using Revolution Analytic’s version). Where SAS may have the edge is reading unusual files where you have to read some data and, based upon that data, decide what other data to continue reading. I see that type of data rarely and I’ve only read it in SAS. The others may be able to do it but I haven’t taken the time to see if they can or not. I’ve been thinking about this lately, and I wonder if this might be a blessing in disguise? Every time our group hits memory constraints, we buy more RAM. It’s cheap, and it grows exponentially cheaper/larger over time. Of course, that doesn’t work for “very large problems”. But, on the other hand, there’s the MapReduce paradigm of divide-and-conquer. I don’t often encounter datasets that I can’t subdivide and process in chunks. Working with on-disc data is orders of magnitude slower (though SSD seems to help quite a bit), and so the dataset-in-RAM paradigm strikes me, after some thought, as a “good idea in disguise”. Excellent summary, thank you very much. The exponential growth of R packages is impressive. I am trying to catch how you measured the statistical softwares on the job market. which shows the prevalence of SAS, but to a less degree. After much study that is the only way I have found to locate “R” that is relevant. If you find another way, I’d love to hear it! Another option to exclude lists is to manually inspect N samples of each query and estimate the chance of a query to be relevant. For example, you may get 5000 hits on an R query and estimate 1/20 to be referring to the statistical software -> approx 250 hits. I ended up doing something similar as described in How to Search for Analytics Jobs. I’ll update the post to reflect this new perspective 2/25/14. It would be interesting to include popular scientific plotting and statistics packages such as Origin Pro, SigmaPlot, and GraphPad Prism. Nice idea! However, I keep pretty busy collecting the current data. Where you say, “No other data analysis languages covered by this article even make their top 100.”, is not true. If you look at the portion that says the next 50, covering 51-100 you will see S, S-PLUS, and SPSS which are all data analysis languages. It is also debatable that MATLAB, PL/SQL and Transact-SQL could be considered data analysis languages. Ken, thanks very much for pointing that out. One of the hardest things about tracking so many sources of information is noticing all the changes that are relevant! I’ll deleted that sentence. This is a very good article. I especially admire the way you have tried to quantify various measures. It’s worth reading just to learn that you can use “not” operators on google and amazon. Most illustrative of trends in stats packages and languages. Thank you! One interesting thing to look at could be comparing trends from the kdnuggets polls. You have the current year but there is also links to some of the prior years. For instance the following show two very different perspectives from two different points in time. I am not sure what all could be done with this but it would be interesting. That’s good idea. I’ll do it if I can find the time! I’m curious about a review of tools used by non-statisticians for analysis in business. Do you know what products that help smooth some of most basic data related tasks that the masses are currently doing in Excel — such as pivot tables, commenting and collaboration? I’ve been building one to try to answer this, and am curious about others! Thanks for all of the details on tool functionalities and preferences for true big data analysts! Fantastic! Is this published somewhere peer-reviewed that I can cite? I’m working on a journal article (which strongly discourages citing webpages) and would love to cite this as a source. Sorry, it’s only available on this web site. I’ve had editors ask me to submit it, but I prefer to keep it as a living document that changes with the data. I’m @BobMuenchen on Twitter and I do tweet when each new post or article is finished. It’s certainly OK to follow me. I don’t tweet a lot, so you won’t be bombarded with crazy messages about where I’m eating lunch! SAS just doesn’t seem affordable except for corporations. Do they even have a single user academic perpetual license? SAS Institute never does perpetual licenses. A single user academic license is very expensive but they do make it very cheap per copy when you get an unlimited-copies license. I use SAS & SPSS frequently for clients and like them both. But when I get to choose, I usually use R.
one tiny error– there are two captions titled the same serial “7a”. maybe you mean 7b in the latter one. That’s fixed now. Thanks very much for reporting it! Do you think you can include more of KNIME in some of your graphs? I am curious to see how it compares. I use KNIME and I have seen it cited only in figure 3 and figure 4. I started out studying just classic statistics packages while the data mining software came from data collected by others. However I do hope to expand the graphs next year to include them. There’s little real difference between the two types of software other than the user interface, which is better on most data mining packages. This is absolutely amazing. Given the passion that most scientists have towards their software packages and that you are a self-proclaimed Stata user, I’m amazed that you can have such an unbiased and rational approach to answering this question. 1) There seem to be way too many stats packages. 2) I was happy to see Number Cruncher Statistical Analysis in there. The copy I have is 10 years old, but I still use it for 3d graphing capabilities. 3) I conducted a web search of “SAS vs Stata” because a coworker uses Stata and won’t shut up about it. I use SAS/Excel…and won’t shut up about it. My hypothesis was that my coworker is using an outdated stats package and he is stubbornly set in his outdated ways. This article mostly disproves that hypothesis, but does give me some ammo on the comparison. Thanks! I actually use Stata only occasionally, and then usually just to study how it does a particular thing. My co-author Joe Hilbe is the Stata guru. It is a beautiful system though. You can tell that a tiny number of people cared about making its structure consistent. SAS, SPSS and especially R were at the mercy of too many developers so their syntax is less consistent. All four are wonderful packages though, and each has an audience that thinks it’s the best by far. I like ’em all! I’ve used R for years, and just bought Stata/IC 13 yesterday for several reasons. First, the company has a great attitude/culture and it’s always good to deal with a company where you like the people. Second, it seems to me to be the best option among SAS, SPSS, Minitab, et al, and it’s also a better deal for an individual purchaser. Third, it implements some algorithms that are more advanced than the R equivalents. And fourth, Stata 13 was just released and has a lot of nice new features. My first thought is that it reminds me a lot of Igor Pro, by Wavemetrics, which I used to use. They both have a great bunch of people (developers and users), a great culture, an interface that you can drive via commands or a GUI (though the GUI generates the command line equivalents so you can learn it or reuse it), and a consistent flavor. The difference being that Stata is statistics-oriented, while Igor Pro is scientific/experimental-oriented. I like Stata a lot, but it won’t replace R. I’d say that it’s much more elegant than SAS, et al. (SAS was developed for punched cards and influenced by IBM’s punched-card JCL, and has all kinds of obvious seams between its various parts. It’s definitely a Frankenstein.) I’d disagree with you that Stata’ syntax is more consistent than R’s though. I believe you’re talking about how functions in R have been written by various people, so the function calls may have some inconsistent argument names or perhaps result formats. On the other hand, Stata suffers from the data (essentially a spreadsheet) versus free-form variable (r(), e(), _b, _se, etc) distinction, which itself sets up various inconsistencies and makes me feel claustrophobic. So I still think that R’s the best option, but have definitely added Stata to my toolbox and it will be there long-term. I’d definitely recommend it to others. To some degree, I think it makes a difference what direction you come to statistics from. If you’re used to programming and like having the full machinery and flexibility of a programming language, R makes a lot of sense. If you don’t really program — you just want to give commands and get results — though you want the option of automating some things or using programs that others have written, Stata makes a lot of sense. Thanks for your interesting comments. I’ve talked to a couple of other people recently make the point that R is better as a programming language, while Stata is easier to use as a way to control pre-written procedures. SAS certainly has some odd inconsistencies, but I’ve used it for so many years that they seem second nature to me. As I mentioned before, my coworker uses Stata and I use SAS/Excel. Unfortunately, my coworker has retired and I have no way to validate my SAS/Excel code with her Stata output. If I were to provide the code that my coworker used, datasets, and any other information required, could you reference somebody to me who can run a Stata program? I can’t seem to find anybody who runs Stata! Great analysis, as always. This is a great resource for the entire analytics community. Thanks! Thanks very much! I really look forward to seeing your survey results each time. Keep that data coming! Thanks for providing an overall big picture of statistical packages. I am using SAS from past couple of years and is preparing for its certification too. As a beginner I always used to wonder about the differences among different statistical packages but your article has answered a lot of my questions. As far as I know, SAS Institute is still the largest privately held software company in the world and I don’t see that changing anytime soon. They continue to innovate, especially by offering complete solutions to problems rather than just offering tools that let you come up with your own solutions. I think the whole analytics pie is getting much larger. While SAS gets a smaller slice of this pie each year, it still adds up to more revenue. Nice data on use of different packages. A couple of comments. It would be interesting to know who is using what software and for what purposes. As an experimental psychologist, for example, I very much like SPSS for its handling of analysis of variance (both GLM and the older Manova). When I was generating course evaluations on my campus for a number of years, I liked to use SAS because of its powerful relational database functions (SQL). The same things could be done in SPSS but not nearly as “elegantly.” Is it perhaps the case that different classes of users are finding the features they need in particularly packages? Finally, we might like to believe that the “best” product wins out, but that is not always the case with respect to software (e.g., Word vs Wordperfect?) and should perhaps warrant some caution with respect to usage statistics. Nice job! You make some good points. Different packages definitely dominate in different market segments. Our campus (University of Tennessee) has a large social science presence and SPSS dominates by far overall. However, among economists Stata is dominant, the agriculturalists and business analytics folks use SAS, and while R use is in the minority, it seems like every department has someone on the cutting edge of their field using R.
I like all these packages for their various strengths and agree that it makes little sense to say which is “best” for everyone. Extremely engaging. Although Sage is much more than a statistical package, it encompasses statistics, and it would be interesting to include it in the mix. Your descriptions of the challenges faced when compiling data from readily available but harder to interpret data shows how much work you have put into this site. Thanks! Thanks for catching that! It’s fixed. Regarding the amount of work, I wish I had tracked it. I do know that the job search section alone took over 100 hours. Now that I understand the problem better, I can update the figures in about an hour, but determining the optimal searches was really difficult. The primary reason I show either both Stata and R code or just R code for the examples in my books now is due to the fact that the far majority of statistics journal manuscripts that I referee or edit use R for examples. SAS and Stata seem to come in as the second most used stat packages. However, I realize that this may in part be due to the type of manuscripts I referee. I’m on the editorial board of six journals, and am asked to referee by a number of others. But these are generally related to biostatistics, econometrics, ecology, and recently astrostatistics (where Python and R are most common). It also seemed to me that most of the books I read or referenced when researching for my books also used R for examples, followed by Stata and SAS. The second reason is due to the students I teach with Statistics.com. I teach 5 courses (9 classes a year) with the company. These are month long courses over the web with discussion pages which I use to interact with those enrolled in the courses. A good 95% (seriously) of enrollees are active researchers working in government, research institutions, hospitals, large corporations, and so forth, as well as university professors wanting to update their knowledge of the area, or learn about it if they knew little before. Students come from literally everywhere — the US, UK, Italy, Australia/NZ, Brazil, China, Japan, South Africa, Near Eastern nations, Nigeria, and even Mongolia. I always ask for their software preference, and have on average 15-30 students. Logistic Regression is the most popular course followed by Modeling Count Data. R is by far the most used software package. I started teaching with Statistics.com their first year (2003) , using Stata. I would accept submissions using SAS and SPSS, but the course text and handouts I used were in Stata. It is a very easy package to learn and it has a very large range of statistical capabilities. But I increasingly had more and more students wanting to use R. So I started to become more proficient, co-authored R for Stata Users with Bob Muenchen, (2010) which really spiked my knowledge of the software and now used the two package equally. My “Methods of Statistical Model Estimation” book with Andrew Robinson (2013) is a book for R programmers, and “A Beginners Guide to GLM and GLMM using R” (2013) with Alain Zuur and Elena Ieno uses only R and JAGS – I am ever more becoming a Bayesian as well. Other book, like my “Modeling Count Data” (Cambridge Univ Press) which comes out in May uses both R and Stata in the text, with SAS code for the examples in the Appendix. R, JAGS, and SAS is used for the Bayesian chapter. Look through the new books that are being authored and the journal articles being published by the major statistics journals. Its mostly R, Stata, and SAS, with SPSS also used in books/journal articles specifically devoted to the social sciences. Minitab occasionally as well. Python and R almost exclusively for the physical sciences. For the many new books on Bayesian modeling, most use WinBUGS/OpenBUGS and R (and R with JAGS), and some SAS. I see Python becoming more popular though.